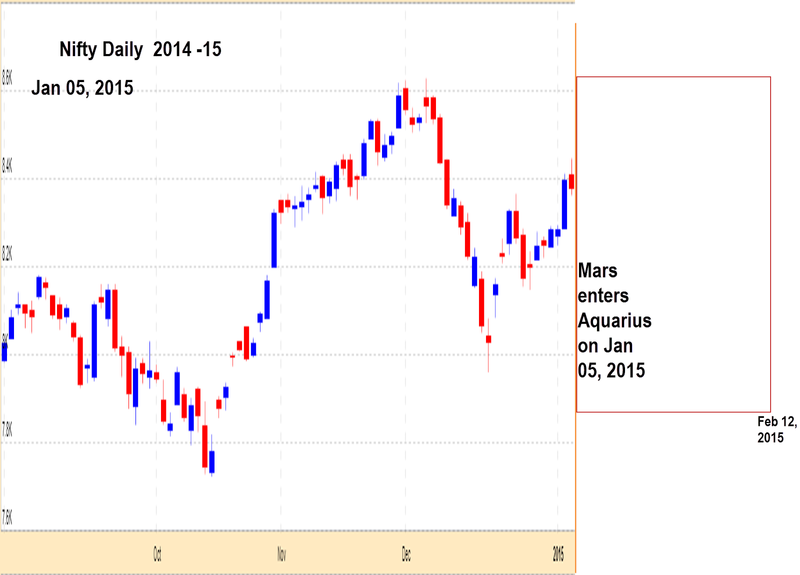 Mars moved into Aquarius as per Indian system, today ( January 05, 2015) and will be there till February 12, 2015. He will move through the constellations of Mars ( own stars), Rahu and Jupiter. 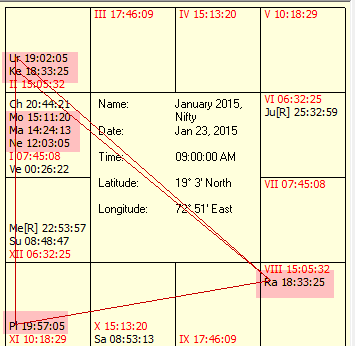 While he is in Aquarius, he will form a square aspect with Saturn,an 8th aspect with Rahu ( dreadful! ), and will have a 6/8 relationship with Jupiter.He will conjunct with Neptune and Chiron, while in Aquarius.These last two aspects tend to rob Mars of his natural aggressiveness and will make things a little confusing. 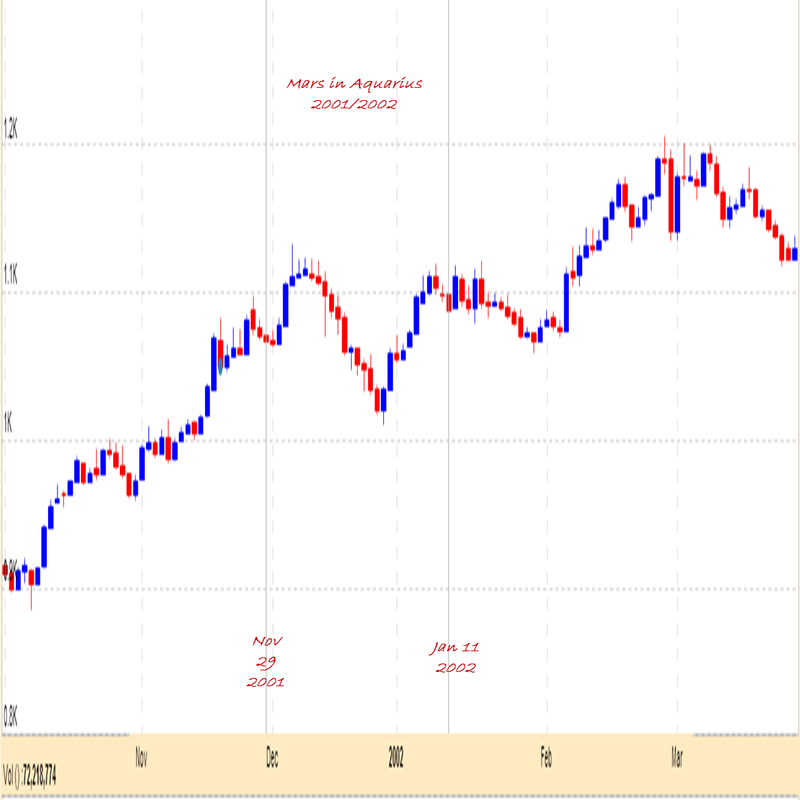 How did Nifty react in the past to Mars transits in Aquarius? Interestingly, Mars was involved with the Nodes in a square aspect then. Rahu in Libra and Ketu in Aries.Jupiter was retrograde in Taurus. Mars in 2011, had a good relationship with Jupiter. Jupiter was placed in the second and with Rahu, even better-Rahu was placed in the 11th! 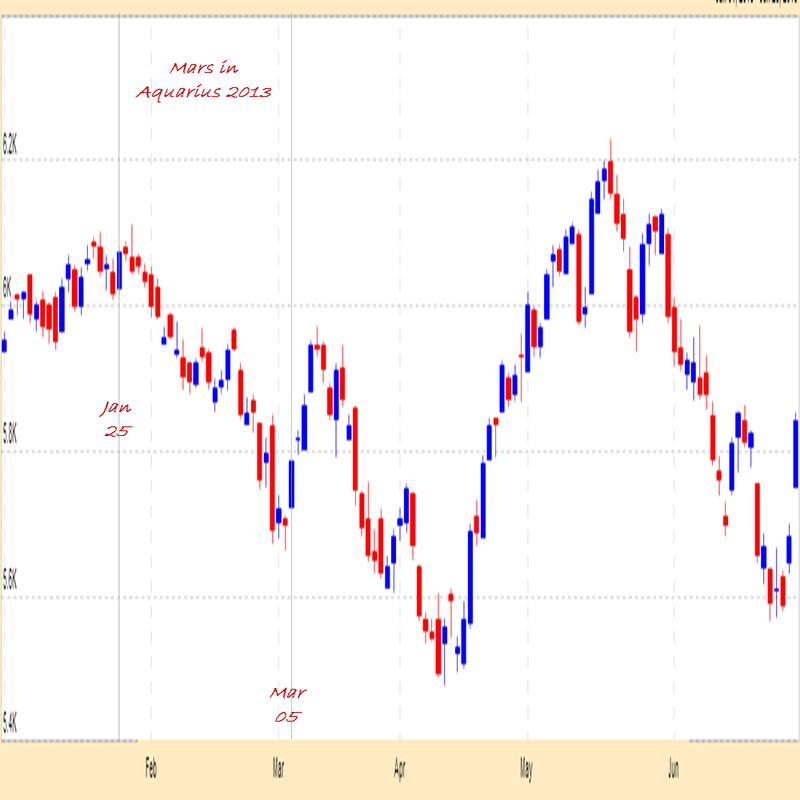 Observe the difference in Nifty movements in 2011 and in 2013. Chiron, Neptune and Mars were all conjunct when Mars begins his trek in Aquarius. A powerful trispect full of energy! Two of the planets involved are long term and Mars is a trigger. Mars connects with both Rahu and Jupiter in trines, when he moves through Aquarius. Additionally Ketu and Chiron, two slow celestial bodies are conjunct in Sagittarius.This is the closest I got, for Jupiter in the north east quadrant to Mars. Ok, this gets a little crazy..I went all the way to 1985 just to check what happens when Mars enters Aquarius and Saturn enters Scorpio? 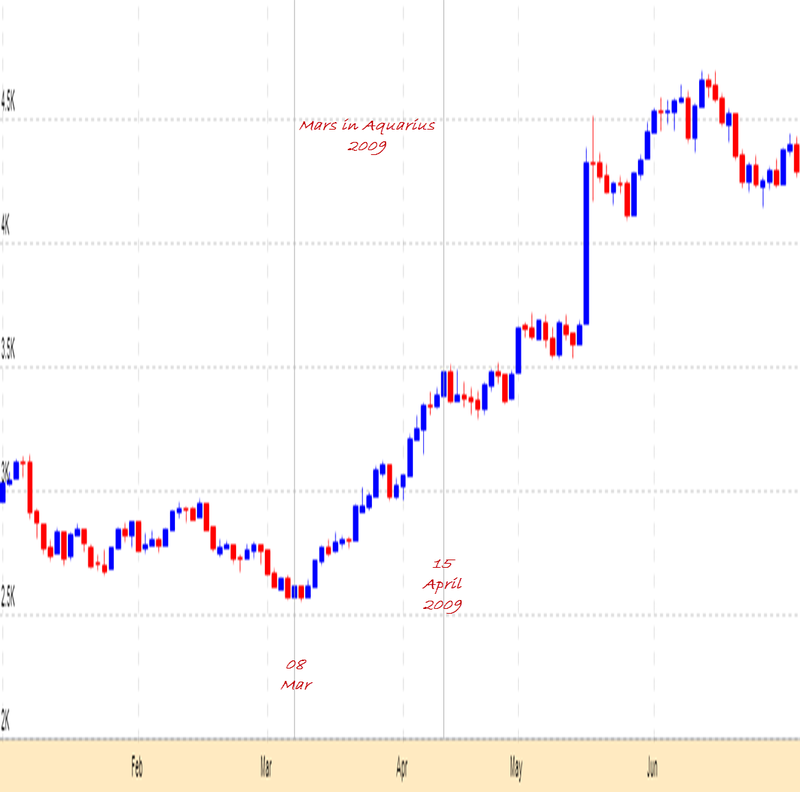 Amazingly, that tell tale dip happened then also. 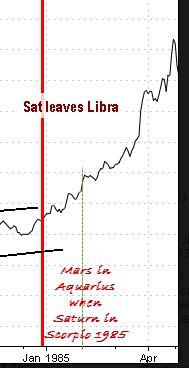 So, whenever Mars entered Aquarius, we had a significant low being formed...Will we get another one now? If so what could be the likely date? In Aquarius, we virtually have a conference of 5 planets..Mars, Neptune, Moon, Chiron and Venus. 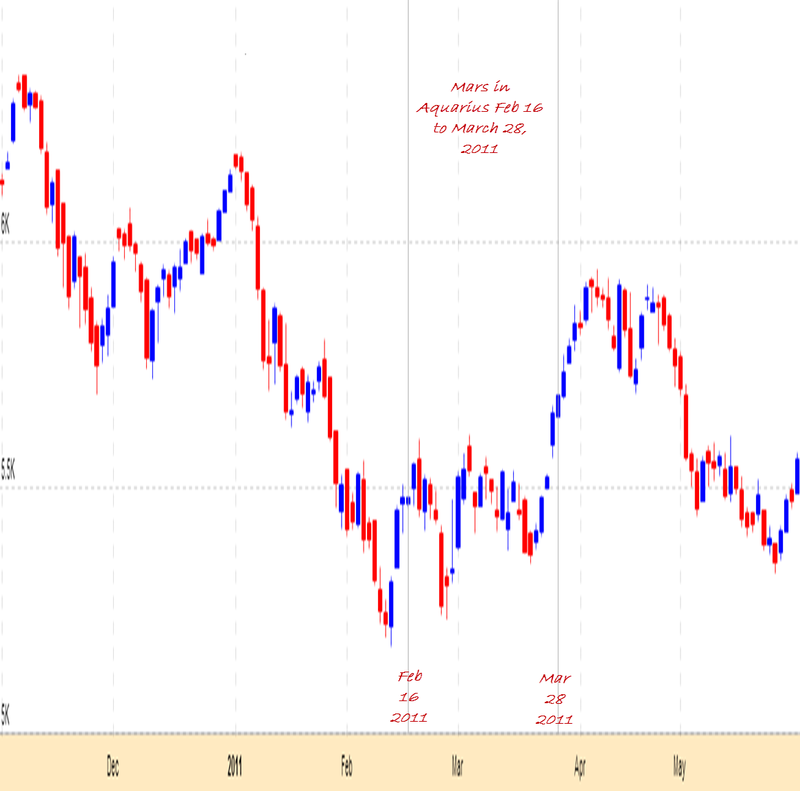 Would the low of jan 6 be a red herring, or job done for the period.